The ubiquity of social stratification on the grounds of gender is alive and with us as we march through the 21st century. One of the frontiers of this paradigm is unarticulated premises regarding who has money and who doesn’t, and the corollary of who is in charge of any collective or responsible for its economic welfare. 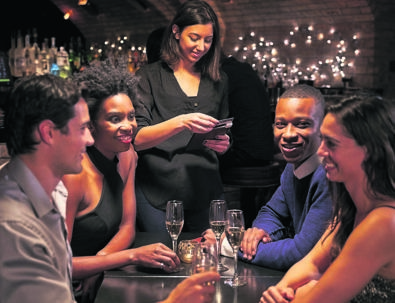 Have you ever wondered why restaurants always hand the bill to whoever appears to the most financially successful man whenever two or more diners are involved? This happened to us a few days ago. After treating a colleague, Dianne, and a male student leader, Fanele, to a late afternoon lunch (ludinner) at Ocean Basket, Dianne requested the bill. When the waitress brought the bill she placed it in front Fanele, who, I must add, was wearing a suit. An awkward silence ensued. Though it must have been for half a minute it felt like eternity. You should have seen Fanele’s face. He was mortified. I quickly picked up the bill, just as Dianne and I started laughing. Fanele, whom I’m not sure knew what Dianne and I found funny, joined in with a rather nervous laugh. Then started a long conversation about the gender implications of what just happened. We surmised that restaurants assume that it is a man’s responsibility and competency to cover the bill. The incident opened the door to an afternoon of sharing stories of other encounters each of us had experienced when assumptions by a waiter regarding who is responsible for the bill led to an awkward silence and embarrassment for the one presumed responsible in particular. Dianne recalled me telling her about how during my Public Protector days waiters would immediately assume that a male Public Protector was responsible for paying. This was in addition to hotel reception staff that occasionally presumed them to be and addressed them as Advocate Madonsela. In the beginning this too triggered awkward silences and anguished faces, but eventually became a source of much-needed free comedic moments that kept us entertained. Dianne recalled another awkward moment and anguished face when my son-in-law was handed the bill at the end of my daughter’s birthday celebration. You could ask why one presumes the singling out of a person is an act of deference to the person in authority or older person. In both cases involving Dianne, she had requested the bill and it is not illogical to expect it to have been handed over to her. Furthermore, Dianne had arranged the celebration and had been the contact person with the restaurant. It is my considered view that though we laughed, what happened is not laughable. I believe it is a symptom of enduring unarticulated patriarchal premises regarding economic power and responsibility. In our conversation, we also dealt with similar awkward incidents symptomatic of unarticulated premises about race and employment seniority. I reserve the discussion on some of the comic stories I’ve heard or encountered about race for another time. But there’s one that speaks to assumptions regarding the intersection of race and gender, and the awkward moments this often generates. While working as chief director at the department of home affairs many years ago, I once called the department to arrange for someone to go over and pick up my emergency passport during the lunch hour. (Don’t worry sister, your boss picked it up this morning.) I politely asked who that may be, wondering if Vusi Pikoli, who was my immediate supervisor, may have picked it up while visiting the centre for his own reasons. I was advised it was the one who had brought me in to make the arrangement the previous day, Mr Dannie Shcmidt. The super helpful Schmidt, who had walked me over the previous day and assisted me with the application, was a director at the time while I was chief director. We laugh about things, but they are no laughing matter. Society’s failure to shift stereotypes regarding the place and role of women and men in society is increasingly cited as the major factor behind toxic masculinity. While we tell girls and women that they are now equal to men, the dominant public narrative as executed through adverts, many religious avenues and other agents of socialisation still tells men that they should be in charge, be the providers, be the protectors, etc. When a man does not meet this “gold standard” they feel like a failure. We discussed with Dianne and Fanele the stories of men who feel diminished when the bill is handed over to them and they have to pass it to their wives, girlfriends or female friends to pay. Anecdotal evidence suggests that even the rise in gender-based violence, including femicide is linked to a male identity crisis. Several young men in universities and technical colleges have admitted having an identity crisis. They feel displaced and opine that their colleagues who resort to violence against women may be doing so as a backlash against women’s ascendancy. A book I read years ago, Backlash: The Undeclared War Against American Women, confirms these anecdotal observations in the case of America during the early years of women making breakthroughs into the economy and other historically male power enclaves. In addition to women’s ascendancy being seen as displacing men, the other problem is about men finding peace with not being the star, or “starring” as we used to call the lead actor when I was growing up, in a context when most media images tell them a proper man should be the star. When men find themselves being supporting actors they have no tools to handle the situation. The unarticulated premises that lead to the bill being given to men are also said to inform pay inequity in the workplace. Oprah Winfrey once quipped about her boss asking her in response to her pay equity demand if she had a wife, kids and a mortgage like the colleague she sought to be paid the same as because they did the same work. It becomes even more difficult when you argue for equal pay for work of equal value as historically female work and related outputs tended to be valued less and paid less than their male equivalents. Think about a secretary and a clerk in government. The latter was historically male and the former female. The pay scale favoured, and in many instances continues to favour, the latter. Back to the bill – we need to know that waiters don’t have discretionary authority. They do as they are told. If the trend has to change, owners must change the rules and related training. How about putting the bill at the centre or giving it to whoever asked for it? As for the rest of society, we need social justice awareness training and a media, particularly adverts, that reinforces equality, related social justice and diversity messaging. It is my considered view that we cannot achieve gender equality without transforming minds. Are you a man with an identity crisis as a result of the ascendancy of women? SMS us on 35697 using the keyword BILL and tell us what you think. Please include your name and province.